← Adding insult to indignity. That’s just the way it flows. Buon giorno, Signore! Aperol spritz per favore. Due per favore, and keep ’em coming, Oswaldo! Put away the whiskey, cellar the heavy reds and prepare to lighten up the portable bar. Spring is here, and I have it on good authority that summer is bound to be close behind. As such, I’ve been thinking about warm weather cocktails of late. Well actually I’ve been thinking about them since I hoisted my first Singapore Sling in a dark bar in Shanghai all those years ago, but that’s a story for another day. Mi scusi Signore, mais est-ce que lei sa dove el mercado qui vend el vino, por favor? Yes, we raised a few eyebrows, but as I have said, the Italians are uniformly among the loveliest, most welcoming people on the planet, and somehow or other we usually got where we needed to go. One thing we got very good at doing, however, was placing our order for a couple of Aperol spritzes at day’s end, and if I’m being honest, at lunchtime, too. 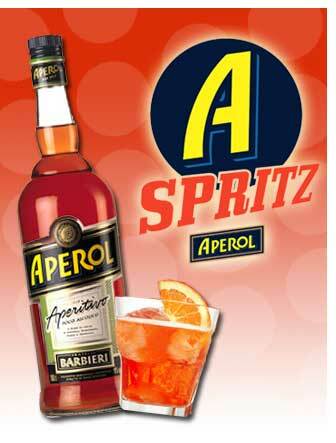 Not familiar with Aperol? Well neither were we, but I went right out and found a source the day we got back, and it’s been all orange slices and prosecco nirvana ever since. Just so you know, Aperol is a bitter orange aperitif, along the lines of Campari, but milder. In the classic Aperol spritz (pronounced shpritz), three parts of prosecco (sweet rather than dry is really best) is poured over ice and topped with one to two parts Aperol (depending on how bitter you like it) and a splash of seltzer water or club soda, whichever you have on hand. This last ingredient is not, strictly speaking necessary, but it does lend a certain bubbly lightness to the drink. I like to garnish with a slice of blood orange for the drama, but if all you’ve got is tangellos or navels in the fridge, they’ll do just fine. If you have nothing but an old bottle of maraschino cherries, that works, too. The flavor is a delightful mix of sweet and sharp, and is perfect for a warm weather gathering when accompanied by little nibbly things of the sort Martha would probably have her slaves whip up in an afternoon. Because I enjoy a spritz or three before the party starts, I just put out a tray of olives, baguettes and cheeses (Ozzie) and let the spritz work it’s Venetian magic on even the stuffiest of gatherings. Posted on April 22, 2013, in Cocktails! and tagged Aperol, Campari, club soda, Florence, Food, Humor, Italy, italy venice, portable bar, random assortment, restaurants, seltzer water, Shanghai, Singapore Sling, Slattern, Spritz, Vacation, Venice. Bookmark the permalink. 19 Comments. Don’t be surprised if I start crashing your gatherings. Olives, baguette, cheese and a glass of Italian happiness? Yes please. Yep, the Italians will bend over backwards to help you if you make an effort to speak their language. To each his own. I swill, therefore I am, as the great dipsomaniacal philosophe once said. Yes indeed different strokes for different folks. I think we’ve had the Venice discussion so I won’t resurrect it. You are a fountain of crucial information, Joe! It’s vital to know these things, I almost made the mistake of booking a dry airline once – to Australia! A lucky escape. Now, at least, we know the exact location of Hell. It is flowing like a mighty river, Susan. I used to like spritzes. White wine, touch of lemon juice and just a tad of soda or sparkling wine. Alas, I’m reduced to lemon seltzer and blueberry/cranberry juice. I am told it’s often for the best. There are days you just NEED a good buzz to make the little gnats that life sets upon you to go away.